As people are becoming increasingly environmentally conscious, the business world is responding to customers’ demands for sustainable products. Furniture manufacturers, for example, are using reclaimed wood to build stylish and attractive tables, shelves and chairs. In fact, using reclaimed wood is becoming an increasingly popular way to build furniture, so much so that reclaimed or antique lumber is primarily being used for decoration and furniture/home building. Why is reclaimed wood so popular? Well, for one, it’s a sustainable and environmentally conscious way to use discarded lumber that would otherwise end up in the trash. When you use reclaimed wood, you are employing all three of the three “R’s: reduce, reuse and recycle. In addition to being great for the environment, reclaimed wood tables and other furniture also looks great, as the different hues and tones of the reclaimed wood gives furniture made from it a unique and striking appearance. Reclaimed wood is also popular for the history it carries. People often scavenge reclaimed lumber from old and dilapidated buildings, which means that the wood may have come from a forest that, unfortunately, may not even exist anymore. Given the increases in clear-cutting forestry practices, the reclaimed lumber a furniture manufacturer uses is a testament to a time when forests thrived. 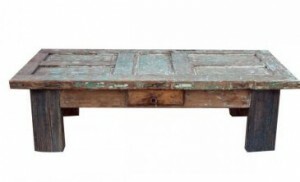 Reclaimed wood furniture not only helps the environment, it also tells a story. What’s interesting to note is that reclaimed wood is not only very attractive in appearance, but it is also incredible strong, resistant and durable. In fact, because a lot of reclaimed lumber can be over a hundred years old, its increased strength is often attributed to the lack of air pollution that existed up until the massive industrialization of the 20th century. In addition, a lot of the wood harvested in the early 20th century was often harvested from virgin growth timber, which grew over the course of centuries and, as such, had a couple of hundred years to develop into strong, durable, and stable lumber. Reclaimed wood is so popular among consumers for its strength, durability, and attractiveness that some sellers will try and pass off newer, distressed wood as “antique.” And, while it might seem contradictory to charge more for furniture made with old wood rather than new, the fact of the matter is that in many cases, furniture and decorative pieces made with reclaimed lumber often come with a higher price tag, due to the increased quality of the lumber. Reclaimed wood, after all, is labor intensive, because it often requires carpenters and manufacturers to remove all of the rusted nails, hinges and metal pieces that are stuck in it. It’s well worth the effort, however, as anything crafted with reclaimed wood is both visually stunning and long-lasting. After all, reclaimed lumber has already beaten the test of time. If you want to add a stylish but highly functional piece to your home, take a look at our selection of reclaimed wood items at FoxDen Decor. You’ll fall in love immediately with their perfect combination of the old and the new.